HOLLISTER -- Calling "Kitty, kitty, kitty," wildlife rescue workers captured a tame bobcat last night in Ridgemark, a census-designated place near Hollister, one of the rescuers said Saturday. Over the last six weeks, reports of a bobcat wandering through yards in Ridgemark came into the San Benito County branch of Wildlife Emergency Services, said Rebecca Dmytryk, the agency's founder. At first, the reports seemed typical. Deanna Barth, who heads up Hollister's wildlife rescue efforts, educated the callers on how to scare off wild cats, as is customary. However, peculiar reports began coming in, Dmytryk said. The bobcat entered a house through sliding glass doors when the occupants were showering. The bobcat followed one person and rubbed against the person's leg, as cats will do - "but not wild bobcats," she said. The unusual behavior indicated that the bobcat had been "habituated, tamed or imprinted," to humans, Dmytryk said. While well-meaning individuals sometimes tame wild animals, it's not the best thing for the animal, she said. Most of the reporting parties were unsettled by the encounters, and "there was a danger to the bobcat and people in the community," Dmytryk said. 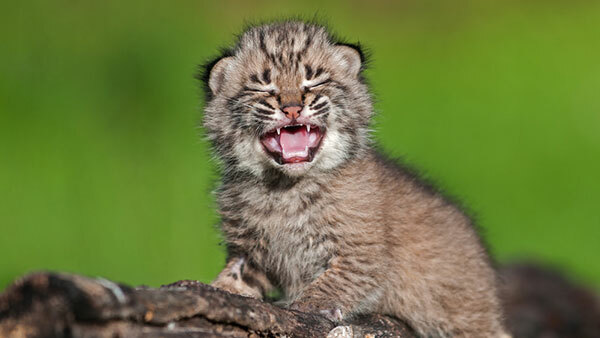 "Someone might have panicked and injured the bobcat, or vice versa." Barth organized a capture effort with Dmytryk. Friday night around 9 p.m., the two went to the area where the cat was most often observed, and found the bobcat in a field. They started calling, "Kitty, kitty, kitty," and sure enough, the tame bobcat responded. After efforts to get the cat into a carrier failed, Barth distracted the bobcat with a cat toy and Dmytryk scooped it into a net. The bobcat is temporarily being held at the administrative officers of Wildlife Emergency Services in Monterey County, Dmytryk said. "We're working on finding a Department of Fish and Wildlife-approved sanctuary" where the bobcat can live, she said. "We think it's a female," but are not yet certain, she said. While the rescuers are "99 percent certain" the creature is a bobcat, there are some features, such as its coat, that might indicate otherwise, she said. Anyone with information about the bobcat and how it came to be tamed is asked to contact the rescue agency at admin@wildlifeservices.org.